Voter fraud is virtually non-existent. 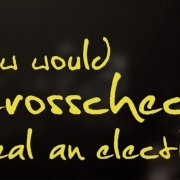 But elections are stolen by widescale, racist voter purges courtesy of Crosscheck. Robert Koehler examines this threat to our democracy. Recently, Stephen Marche accused Peter Thiel, Girard student and famous tech billionaire, of scapegoating Gawker by financing Hulk Hogan's lawsuit against it. It's good to be in touch with the scapegoating mechanism, but Marche misses the mark on mimetic theory. Suzanne Ross explains. Nuclear Disarmament: If Not Now, When? The Marshall Islands, ravaged by 12 years of US nuclear testing, is suing the nine nuclear-armed nations to disarm. "The lawsuits ask: 'If not us, who? If not now, when?'" Robert Koehler is hopeful that we can heed the call.